Mike N. Durschmid has been an inspiration to generations of activists working for a compassionate and just world for people, plants, and animals. We are honoring Mike's passing by establishing an organic memorial garden and off grid solar array on the microsanctuary grounds at Wild Earth Farm and Sanctuary. In the memorial garden visitors can reflect and relax surrounded by nature, as well as interact with rescued animals. We will plant organic fruits, vegetables, and flowers using regenerative permaculture methods. The circular garden will include perennial plants which attract pollinators, and be surrounded by habitats for rescued chickens, ducks, pigs, turkeys, rabbits and turtles. Ponds, paths, and benches will be interspersed with educational displays such as the veganic composting system that Mike built. The garden and microsanctuary will be powered by renewable energy via an off-grid solar system, which will power ponds for the turtles and ducks, and ensure the rescued animals have warm cozy beds in winter. The solar panels will also provide power for events Mike would have been so excited to be a part of, such as organic farm to table dinners, potlucks, and seasonal and harvest gatherings. Mike deserves to be honored in a way he would have loved, in a place he did love and hoped to live at one day, and in a manner which will continue to inspire generations towards compassion, resiliency, and sustainability. We love you, Mike! Please help us honor and remember Mike, with a donation here or on our website. Please read more about Mike's designated charity, Wild Earth Farm and Sanctuary, and donate at www.wildearthsanctuary.org! Thank you for supporting Mike's legacy! This video is a picture into Mike's life and activism. Thanks to everyone who recently donated and contributed to the silent auction at Mike's recent memorial in Chicago! Great quotes for the garden are rolling in. Send us your ideas. Here are a few! Contest time! We are collecting quotes, sayings, poems, words, art, and images to feature in our upcoming Memorial Garden. 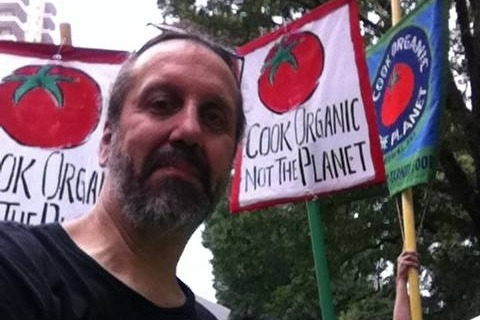 The garden will be in memory of Mike N. Durschmid, who was a staunch activist for earth, animal, and people liberation and especially fought against the dangers of genetically modified foods. Please submit your favorite words or designs (original or not) here or email us. The winning entry will be featured on a plague in the garden and other winning words or images will be highlighted in the book that will accompany the garden. Go!